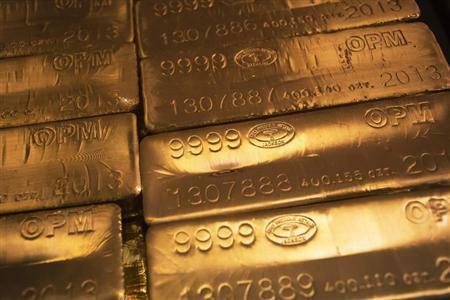 LONDON (Reuters) - Gold gained nearly one percent in thin year-end holiday trade on Thursday, but was still set for its biggest annual loss in three decades as investors switch to rallying equities on optimism about a global economic recovery. Signs that the U.S. labour market is improving - data on Thursday showed weekly jobless claims decreased 42,000 to a seasonally adjusted 338,000 last week - propelled the price of more industrial precious metals higher, with spot platinum <.XPT=> heading for its biggest daily gain since October 17, up two percent. Spot gold, flat initially, rose as much as 0.9 percent to a one-week high of $1,215.70 an ounce earlier and was trading up 0.8 percent to $1,213.60 by 1519 GMT. U.S. gold futures for February delivery also rose 0.9 percent to $1,214.40. "Gold (is) looking better ... as shortcovering and year-end buying back of hedges and previously sold contracts ensues with few around to offer with limited audience," RBC Wealth Management said in an emailed comment. Bullion fell to a six-month low of $1,185.10 last week after the Fed said it would begin tapering its $85 billion in monthly bond purchases next month, before recovering slightly. And traders betting the metal's price would endure further losses were this week forced to cover their short positions, analysts said. Gold is headed for a near 30 percent slump in 2013, ending a 12-year rally prompted by rock bottom interest rates and measures taken by global central banks to prop up the economy. The decline this year is set to be gold's biggest annual loss since 1981, while current prices are 37 percent below an all-time high of $1,920.30 hit in 2011. Analysts and traders expect prices to drop further next year, but not to the same extent. "Early next year we could test the $1,000 level but I don't expect prices to decline as much as this year. From mid-year onwards, depending on economic data, there could be some recovery," said one Hong Kong-based precious metals trader. This year, a combination of a recovering global economy, rallying stock markets and stubborn low inflation in the United States have erased gold's appeal as a safe-haven and as a hedge against rising prices. U.S. stocks are on track to become the top investment in 2013, with the S&P 500 index on course to mark its best year since 1997. Several brokerages such as Goldman Sachs, BNP Paribas and Societe General expect gold prices to drop below $1,150 in 2014. Physical demand, which had climbed to peak levels earlier this year as gold prices fell sharply, has now cooled - lessening its support for prices. In other precious metals, silver rose 2.3 percent to $19.94 an ounce, having earlier touched its highest level since December 18 at $20.02. The metal is however down 36 percent for the year, its worst annual performance since at least 1982. Spot platinum was up 2.2 percent to $1,358.50 an ounce, rebounding from its lowest since early July at $1,309.75 hit on Thursday. Spot palladium rose 1.3 percent to $700.00 an ounce.